In Puggles, the curriculum for two-year-olds we use in our AWANA program, a great deal of time is spend exploring God’s creation with simple lessons detailing many aspects of the creation story. Whenever I can, I like to supplement the material in the lesson book by creating fun play spaces and sensory activities so that even their play time reinforces the material in the lesson. There are several weeks in the curriculum that focus on how God made the animals. I enjoy that the material takes things that children at this age are naturally curious about and provides them with the foundational understanding that God made it! One of the animal lessons focused on pets. 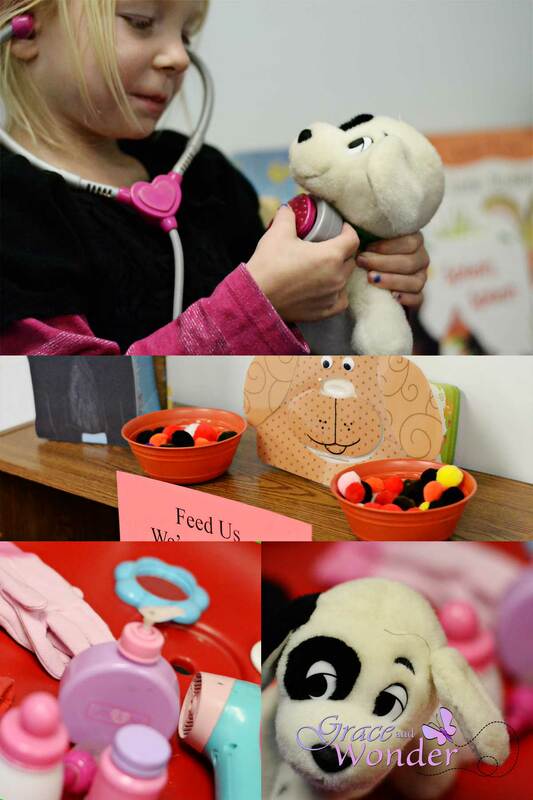 For this lesson, I set up a pretend play space with a makeshift pet store, a feeding station, a grooming station, and even put out a doctor kit so the kid could pretend they were a pet doctor. I teach in another area during AWANA, so I rarely get to see the kids interact with the materials, but I enjoy the process of creating an intentional environment. I try to use materials we have on hand at the church, those I can borrow from my own children’s toy collection (thus the very girly grooming items), or things I can pick up inexpensively at the thrift store. For the feeding station, I used a shoebox and an old baby wipe container. I freehanded a cat and dog shape and then provided the kids with some colored pom poms to use as food. I cut a hole in the shoebox for the cat’s mouth, but for the dog, I was able to rig the baby wipe box so that if you pushed the dog’s nose, the mouth would open. I was a little too impressed with my creativity on that one! Felt like an early childhood genius for a few moments. Feeding pets pom pom activity. For this lesson, I combined several ideas I found on Pinterest to create our pretend play space area. My typical process when preparing for lessons is to read through the provided curriculum and determine what I will use/ not use, use Pinterest to get my ideation flowing, and then determine what time/ resources I have available to create something that is inviting, but not so over the top that I will be irritated when those two year olds come in and start having fun destroying all my pretty set up! Because I am not in the room, I also keep my volunteers needs in mind when I plan things. I have a great group of volunteers, but I don’t want to tire them out with things that are really messy week after week. Pet Feeding Station- Dirt and Boogers The exact link from Pinterest is broken, so this is a link to the home page. For more Puggles inspiration, you can check out my Puggles board on Pinterest here.